Geraldton Air Charter is an air charter company based at the Geraldton Airport in Geraldton, Western Australia. Geraldton Air Charter first commenced commercial operations in March 1997 with one pilot and one cross-hired aircraft, and in the following years has steadily grown to operating nine aircraft, employing four pilots and an administration officer. The Chief Pilot and Managing Director of Geraldton Air Charter, Wendy Mann has been flying for over thirty five years and has amassed thousands of hours of flight time in Western Australia, and has also flown in almost all Australian States and Territories. Their fleet of aircraft is made up of twin and single engine aircraft enabling the company to cater for your specific needs twenty four hours a day and seven days a week. They specialise in charters to any required destination, many varied types of airwork. Their offices and departures and arrival lounge are conveniently situated in the Northern Precinct of the Airport, just off Gordon Garratt Drive. Just look to the left as you approach the Airport Gate and you will see them. Turn left about 60 metres after the Airport Gate and follow the road down. Before departure your pilot will provided you with a detailed talk on the Abrolhos Islands including the history and information on the fishing industry as it is today. Depart Geraldton at either 9am, 11am, 1pm or 3pm, overflying this beautiful city and then tracking for an extended scenic overfly of the three main groups of the Abrolhos Islands – the Pelseart, Easter and Wallabi groups. En route your pilot will point out the pearl farms, the historic church on Basile Island, the brightly coloured fisherman camps, marine life including sharks, manta rays, dolphins and migratory whales (in season) and some of the shipwrecks, for example the Zeewijk (1727) and the famous Batavia (1629). You will also overfly Webbie Hayes’ fort, the oldest European building in Australia. You will land on East Wallabi for either morning or afternoon tea. Upon viewing the Batavia’s shipwreck site, your pilot departs overhead Beacon and Traitors Islands to return to Geraldton. 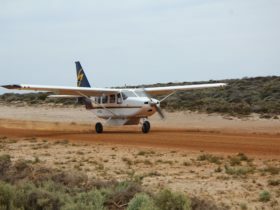 This tour, in their Bonanza Aircraft, takes you from Geraldton direct to Mount Augustus (Burringurrah) in a two hour flight that passes over farming areas, and sparsely populated pastoral stations. Before landing you will fly around the southern face of the Mount. And then land at the Mount Augustus Outback Resort which is situated on a working cattle station. Subject to availability, a vehicle can be hired to drive to Cattle Pool and to Flintstones, the site of some ancient Aboriginal rock art. Overnight accommodation is at Mount Augustus Outback Resort where you can enjoy the sunset and sunrise. 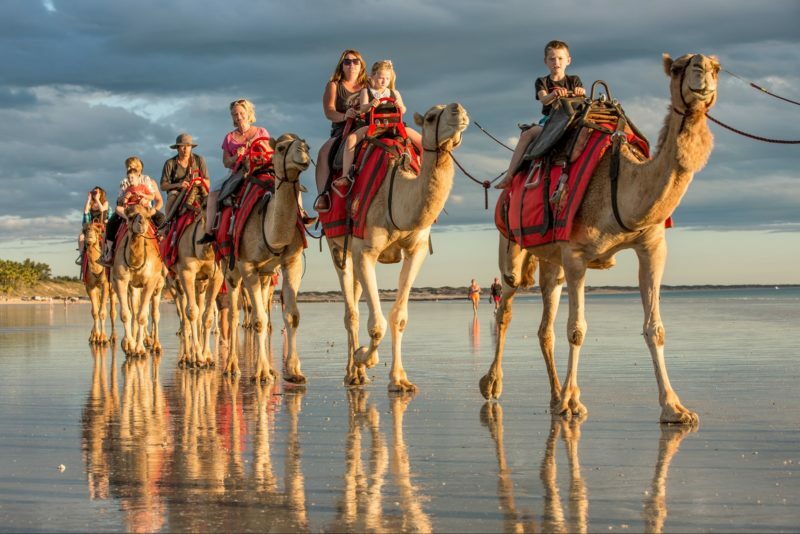 Next morning the tour departs for Carnarvon, a coastal town famous for its fruit and vegetables, and you will fly over the spectacular Kennedy Ranges en route. After refuelling, and the chance for lunch at one of the outdoor cafes in town, or one of the banana plantations, you will return to Geraldton via the Hamelin Pool, then track the Kalbarri Murchison River Gorges to Geraldton. A full day tour with a romantic touch. Geraldton Air Charter provide a romantic lunch, champagne and flowers, all in a private and intimate setting. Geraldton Air Charter can customise tours for special requirements to take anyone to any place. 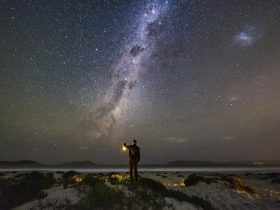 Particularly suitable for tourists with any special requirements or tourists who would like to go to any special destinations in the limited time in Western Australia. Scenic flight from Geraldton over the beautiful Houtman Abrolhos Islands. Landing at East Wallabi Island, walk down to Turtle Bay, have morning tea, snorkel on beautiful coral, have lunch and take a guided nature walk. Return to Geraldton via Long Island, Beacon Island and the Batavia Wreck site. The flight leaves from Geraldton Airport at 9am and returns at 3.30pm. This day trip to Monkey Mia leaves Geraldton at 7am. This scenic flight follows the coastline from Geraldton to Kalbarri, overflying the Geraldton Port and Marina, Lynton Station, the site of a Convict Settlement, Port Gregory and the Hutt Lagoon, the spectacular coast cliffs south of Kalbarri, the mouth of the Murchison River and the town of Kalbarri. The tour continues to follow the rugged coastline, seeing the Zuytdorp Cliffs until leaving the coast at Womerangee Hill. You will then overfly Tamala Station and the Henry Freycinet Estuary before landing at Shark Bay Airport. You are are then transported to Monkey Mia to enjoy seeing the world renowned dolphins. (Arrival of the dolphins on the beach is expected, however cannot be guaranteed). After viewing the dolphins there is time to enjoy a wildlife boat cruise (optional) which includes a tour of the Blue Lagoon Pearl Farm or just relax on the beach or enjoy lunch at the Bough Shed Restaurant which overlooks the beach. Half Day Tour of the Abrolhos Islands, conducted from the Geraldton Airport. Depart Geraldton just after 9am or 1pm, overflying the beautiful city and then tracking for an extended scenic overfly of the three main groups of the Abrolhos Islands.- The Pelseart, Easter and Wallabi groups. En route your pilot will point out the pearl farms, the historic church on Basile Island, the brightly coloured fishermen’s camps, marine life including sharks, manta rays, dolphins and migratory whales (in season) and some of the shipwrecks – for example the Zeewijk (1727) and the famous Batavia (1629). You will also overfly Webbie Hayes’ fort, the oldest European building in Australia. After walking to beautiful Turtle Bay you will have morning or afternoon tea, followed by the options of a guided snorkelling adventure or a guided nature walk to view the osprey’s nest, white breasted sea eagles nest and the feeding platform, lizards, crabs and spiders. On departure you will see Long Island (where the Batavia Mutineers were hanged), Beacon Island where many of the mutineers’ victims were buried and the Batavia wreck site, overflying the Geelvink Channel before returning to Geraldton. Enjoy a scenic flight over Port Gregory, Pink Lakes, Coastal Cliffs, Murchison River Gorges and beautiful farming lands. This scenic flight follows the coastline from Geraldton to Kalbarri, overflying the Geraldton Port and Marina, Lynton Station, the site of a Convict Settlement, Port Gregory and the Hutt Lagoon, the spectacular coastal cliffs south of Kalbarri, the mouth of the Murchison River and the popular tourist town of Kalbarri. The flight will then follow the river to Murchison House Station, and then fly direct to the Loop and the Z Bend gorges of the Murchison River. You will follow the river south until it turns to the east towards its source many kilometres to the north east, and then return to Geraldton overflying the rich farming lands of the Northampton area and the Moresby Ranges before landing back in Geraldton. The Overfly Scenic Tour is a perfect opportunity for those who would like to experience the beautiful Abrolhos Islands, but are time restricted. Personal gifts, birthdays, and special occasions, just to name a few. The following outlines the itinerary for the Overflying Tour. You depart Geraldton at either 9am, 11am, 1pm or 3pm, overflying this beautiful city and then tracking for an extended scenic overfly of the three main groups of the Abrolhos Islands – the Pelseart, Easter and Wallabi groups. Departing from Geraldton Air Charter’s office, you will fly over the Pink Lake for eight minutes before landing on East Wallabi Island. You will then go to Turtle Bay and enjoy the wild environment and beautiful beach scenery. After morning tea there is time for a nature walk time where you might spot wallabies, lizards, Sea Eagle’s nest and visit a cave. After a delicious lunch you can enjoy snorkelling over the beautiful corals. It is then time to leave the beach and return to Geraldton.